Winners must email Sue at sue@suebleiweiss.com with their full name and mailing address by 10/14/11 in order to claim their prize. 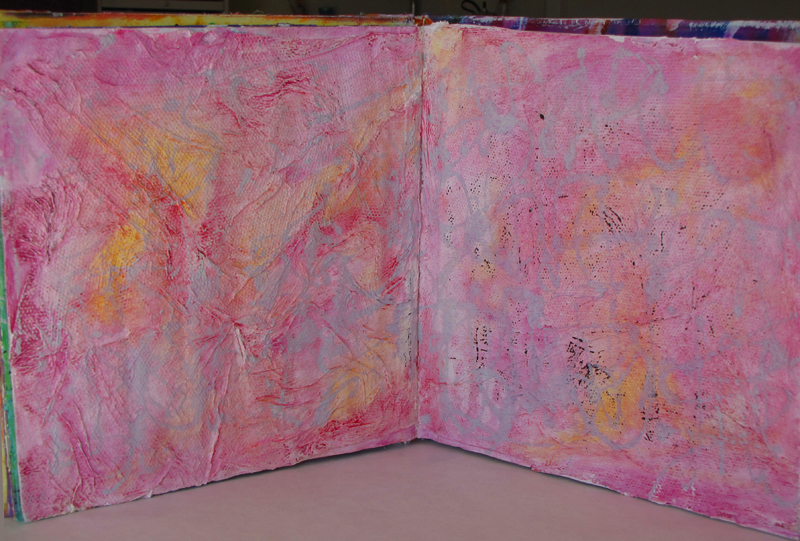 Three winners will receive a 5"x8" mixed media visual journal! One large Thermofax screen and 1 bottle of paint! A complimentary subscription to Somerset Studio Magazine and one free copy of the latest issue of Art Journaling magazine! An Old Technique Is Made Young, Again! While thumbing through my sketchbooks last week, I found a texture I'd created years ago and then left white and sad and blank. I immediately took after it with watercolor paint, changing colors frequently. 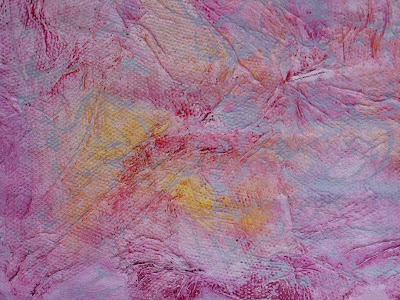 I fell in love all over again with the way the pigment pooled into the nooks and crannies. This technique (an old crafter's trick, actually!) is incredibly easy to create and only takes a few basic supplies. 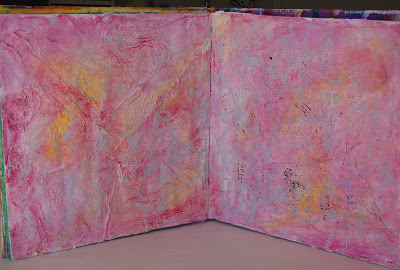 Note: If your sketchbook pages are lightweight, I recommend first gluing a few pages together; a thin layer of gel medium between each page will yield a firm painting surface once dried. Step 1: Prepare your surface by troweling a layer of white paint onto your sketchbook page with a plastic paint scraper or palette knife. Be generous in some areas and create a thin layer in others. Allow your trowel marks to show. Messier is better, in this case! Step 3: Prepare your paper towels by separating one ply from one another and tearing each sheet into irregular pieces. Try to break down the paper towel's straight edges by tearing divots into them. Step 4: Using the bristle brush and more of the thick, white paint, begin collaging the paper towel pieces, using the paint as a glue: paint the sketchbook page with paint, lay the towel into the paint, and paint more white on top, mashing, pushing and even tearing the towel a bit to create folds and a wrinkled texture. 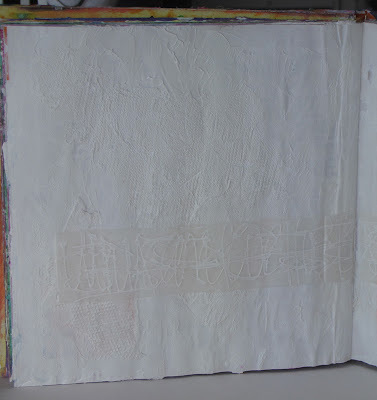 Cover as much or as little of your surface as you desire but try to be sure that all parts of the paper towel are adhered to your sketchbook page with no air bubbles or lifted edges. Allow the page to dry completely. Step 5: Color, color, color! 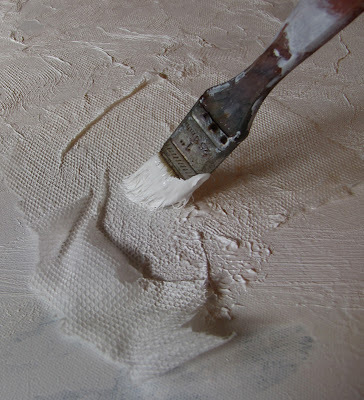 Working wetly with thin "glazes" of paint, paint the page, allowing the colors to puddle together and blend into the textured areas. 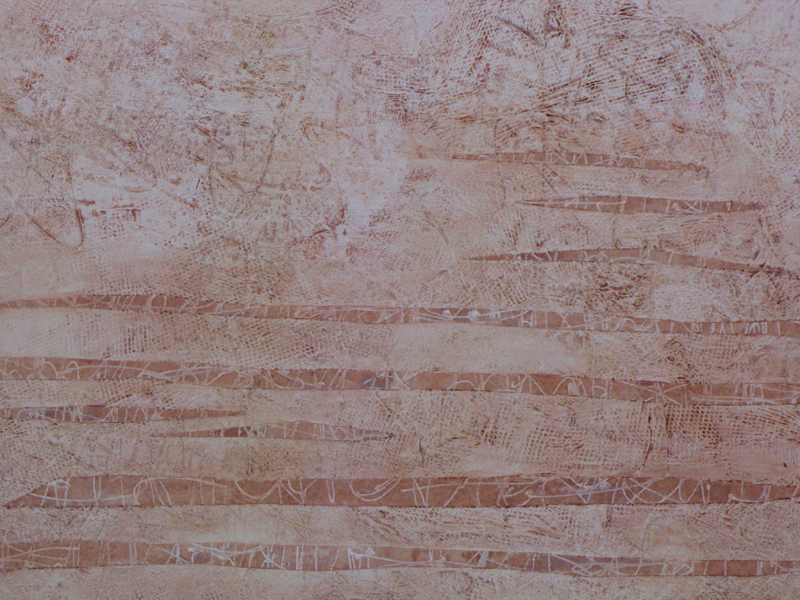 As the paint dries, the pigment will settle into the creases and wrinkles you've created, highlighting them further. 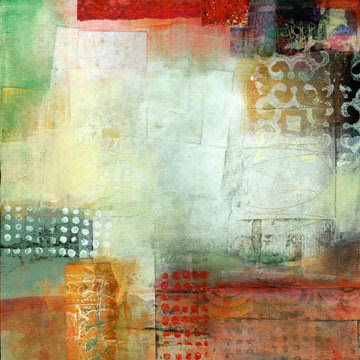 Once dry, the page you've created can become a background for more collaged elements, or can stand alone as a lovely study of texture and contrast. 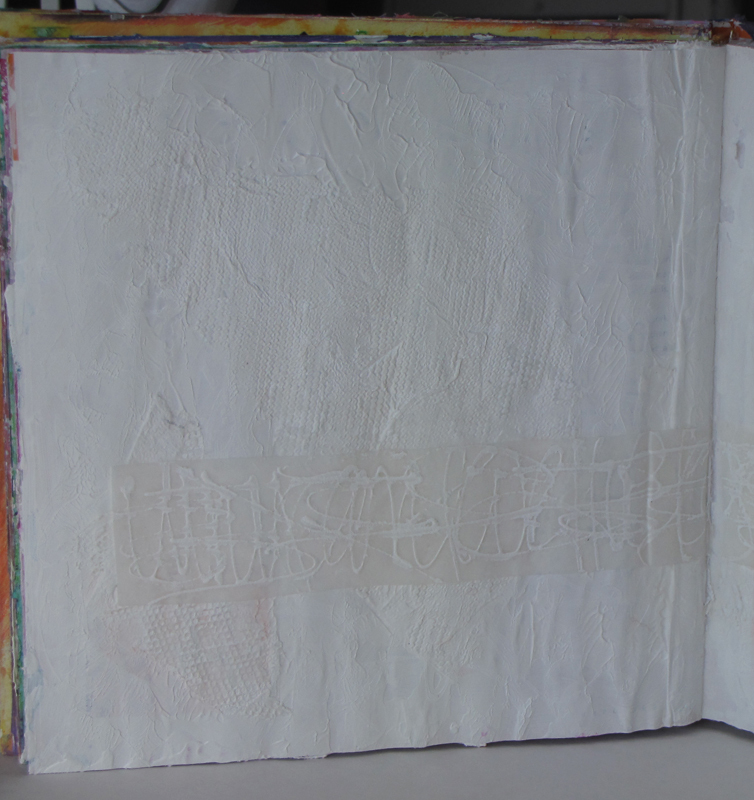 This week, while recreating this technique on a fresh spread of pages in my sketchbook, I experimented with using Lutradur as a collage element for a white-on-white study. I painted Stacked Journaling on a strip of Lutradur with white paint squeezed directly from the bottle, and then adhered the strip to my sketchbook page with heavy gel medium. 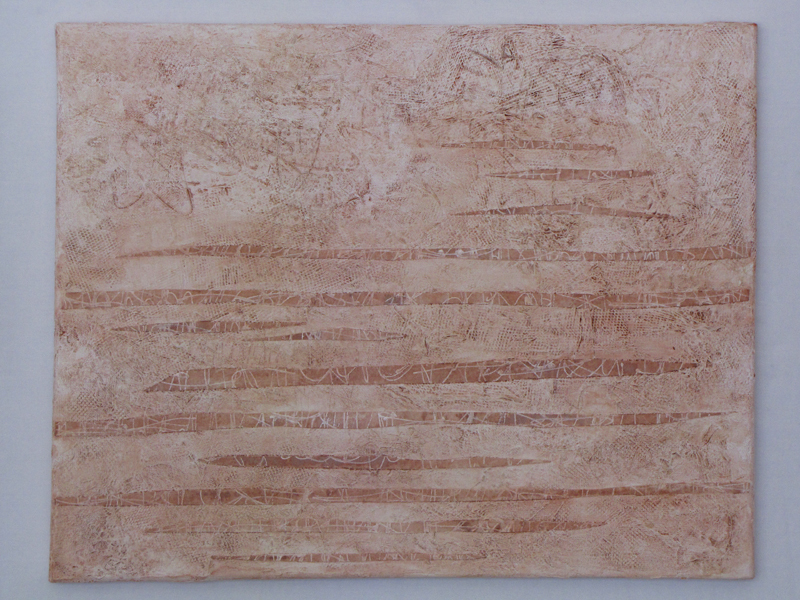 ... but still wanted to bring out the texture more. 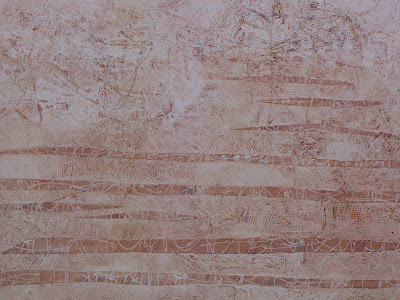 I took my idea to a small stretched canvas and this time, added washes of Titan Buff and Burnt Sienna. It really makes the texture pop, doesn't it? I also cut the Lutradur into more organic strips and adhered them with gel medium. The next step for this study in texture, neutral color palettes, and - of course- Stacked Journaling is to create another art piece, this time on a stretched canvas measuring 30" x 40"- but its completion will take time and many more layers! The power of the sketchbook never fails to amaze me, and I'm so glad I've gotten them down off the shelf to play with them once again! 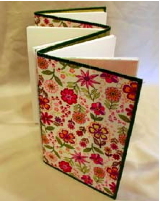 I couldn't help but be inspired by Seth Apter's Altered Page Paper Stack Project. People are taking photos of their journals all stacked up and it's impressive. It's more than impressive, it's simply delicious. I want to scoop them up and begin devouring them. All those secrets, hidden in messy stacks. Everyone's stack is completely different because everyone's journaling and sketching style is different. What struck me most about all this delightful stacking is how it enables you to see how much work you've actually done. 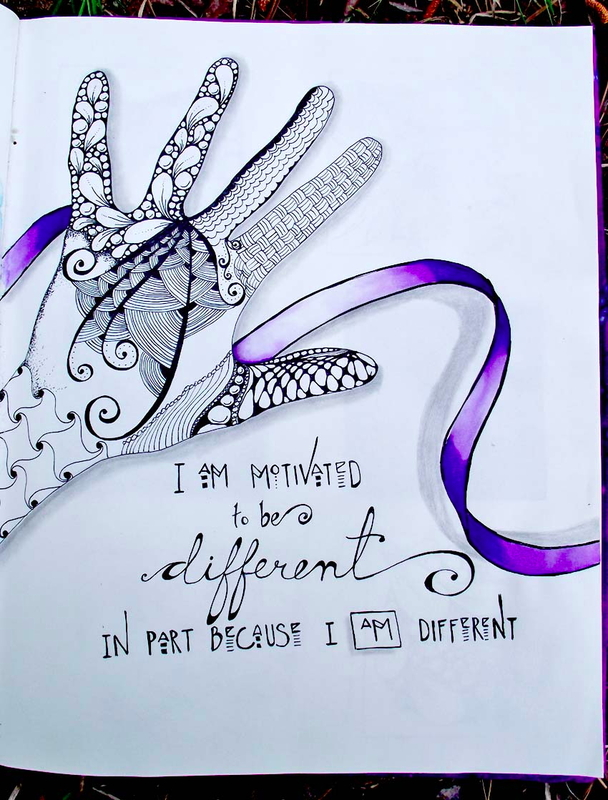 We tend to kick ourselves about and downplay the work that we are getting accomplished. 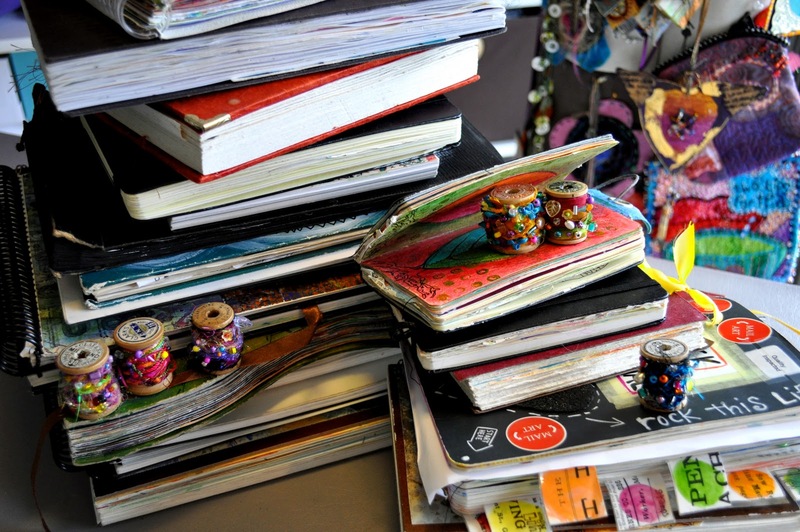 Stacking up those journals, paintings, quilts....whatever your medium of choice, is testament to your artistic achievement. Okay, so not all of the pages are full. That's just fine. The universe is *not* going to rain down on you. Stack away dear friend. All you need is two of something to qualify as a small pile. Show the world your creative ambition! When you've created the Eiffel Tower of journals or mixed media madness, take a photo. 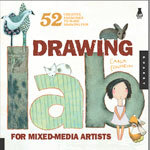 Now that you've uncovered those long lost sketchbooks, it's time to unfurl them and lay down some marks. Remember the joy you had when you first started them and begin again. 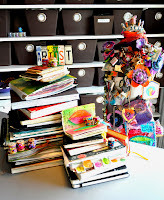 Your stack will continue to grow as you pursue this journey of art. 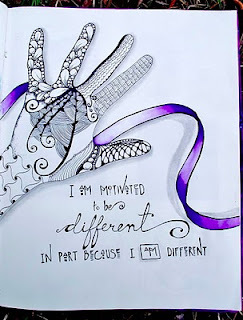 It's really helped me branch out into different mediums. Seeing all the wonderful tutorials, I have to rush to my craft table to try them all. Sometimes I'm not successful (I don't post pics of disasters), but most of the time I learn a new trick or technique that helps in all areas of my artwork. It depends on the challenge. I just started participating in March, but I sat so long reflecting on 'spilling over' that I ran out of time. I just couldn't jive with it. Either that, or I was too busy playing with all the new styles and tips I was finding all through the site. But for this month's challenge, I just kind of took a big leap and started pasting and collaging in my journal, something I don't normally do. Right now I have two main journals, and one little mini-journal that I keep in my purse when I want to test out new art supplies. One of my big journals is a sketch/drawing book only, the other is for anything that catches my eye but I allow myself to make a huge mess in it. 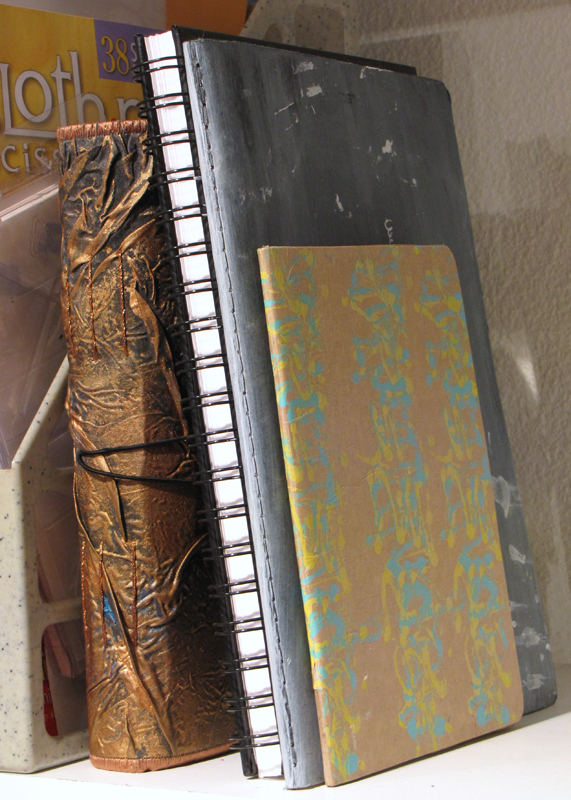 My 'messy' catch-all journal preference is spiral-bound, 8.5 x 11. I love the ability to just rip out a page if it's not working or if I need to make room. I love the Strathmore series with the recycled covers. My sketch/drawing journal is bigger, 11 x 17, with a nice bristol paper. It was a re-gift from a friend, so I'm not sure of the make or exact type of paper, but it's roomy enough for all my flowing experiments. I love using watercolor crayons, but recently discovered the effects I can get with the Tombow markers and a water brush. I'm also in love with Golden Fluid Acrylics -- I love how they can pool up and spread out when painted wet-on-wet, or the opaque deep jewel-tones that can be achieved when brushed straight on. I love how inspiring and educational this site is and all the blogs and sites I've discovered through the Sketchbook Challenge. I've learned so many new techniques, patterns, and projects from trying out the suggestions, it's like being back in school but better because I can do most of it while still in my pajamas! While in some cases I do exactly what I see on the tutorial or blog page (and I admit, it feels like I'm copying someone else and I know I can't claim the work as solely my own), it does help me to learn what to do for later projects and ideas. Other times, I "get" exactly what is being demonstrated and I can take it and run with it right away. Jamie Fingal here, sharing a glimpse into another side of me - Girl Scouts. I have been designing GS themed artwork since 1999. For myself, troops, service units, GS Councils and my own council - Girl Scouts Orange County in California; Above is my version of Juliette Low, the founder of Girl Scouts, and she was the official logo for Urban Adventure for a couple of years at our council. The artwork is 8-1/2" x 11"
Above are GS icons that are one inch squares. Yes, they are small. I draw them on graph paper with pencil to start, then in black ink. Then I copy each one onto bristol stock, so I can paint them with watercolors. This method has worked well for me over the years, especially if I happen to need an icon in a different color format, I can copy and begin again. It's also nice to have B/W for other purposes. Here they are all painted, and this is just 2 pages worth, I have several - as lingo, program and opportunities change in GS. These have been used for brochures, awards for older girls, promotional materials, and most recently, a blog for a friend. 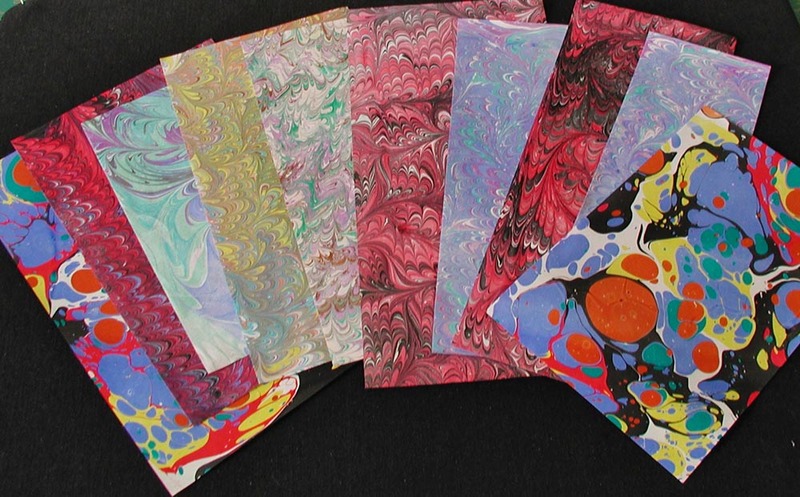 I also designed note cards and was at one time an "Official Licensed Vendor of GSUSA." I made this small quilt with one of my card designs that was photo transferred onto fabric to made a focus point, and added fun fun fabrics and buttons around the edges. My newest group of GS icons, that were drawn and painted directly onto watercolor paper. Maybe I am evolving? Stop the presses! 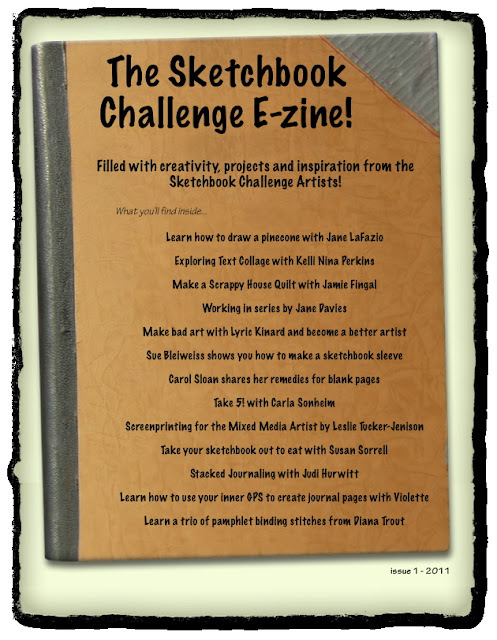 The first Sketchbook Challenge E-zine is now available for purchase! Important information regarding printing this document for binding:This e-zine has been formatted for on screen viewing. If you want to print a copy to have bound then you must scale the document to 90% to allow for a wide enough left side margin. In the print box, select the scale option and change it to 90%. Please print a test page first (we recommend page 5) to make sure that the setting is appropriate for your printer before printing the entire document. Want to read the zine on your IPAD or Android Tablet? In order to get it onto your IPAD you'll need to save it to your computer first and then use an online transfer vehicle such as dropbox.com. Upload the zine to your dropbox account and then go to your Ipad and search the app store for the dropbox app. Install that on your Ipad. Open the dropbox app, log in and you'll see your dropbox files. Download the zine to your Ipad. Since it's an adobe document you'll need to have some sort of pdf reader app installed. Ibooks works great for this. For Android devices, simply follow the link to purchase and download your zine. On Android, files do not launch automatically, so you'll have to go find the file. To launch and access pdf files, search the Android market for a file manager app like Astro. Download the Astro or other app and use it find the files stored on your device's memory or storage card. After downloading the SC Zine, open Astro and navigate to the "downloads" folder. Locate the file sczine_final.pdf and click on it and it will offer reader options based on your own device (eg. Adobe Reader, Aldiko, LumiRead, PDF to Go, etc.). Any of your installed readers should work. Enjoy! The Sketchbook Challenge E-zine is in pdf format and include step-by-step instructions and full-color photo illustrations. You must have Adobe Acrobat Reader 5.0 or higher to be able to open the lessons. Adobe Acrobat Reader is a free software that you can download from the Adobe Website here. 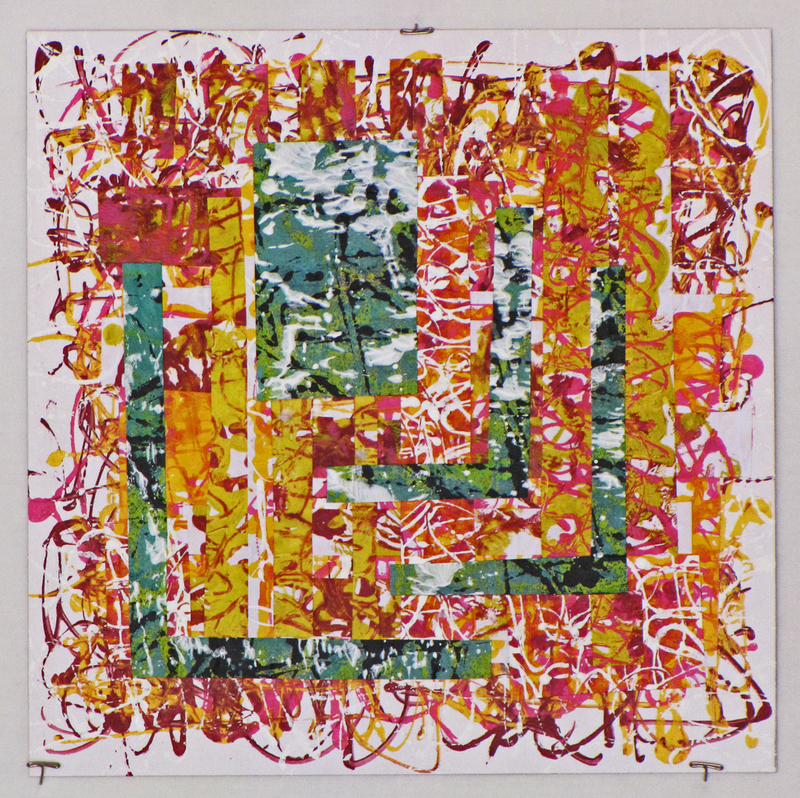 POST A REVIEW AND WIN A PIECE OF MAIL ART! 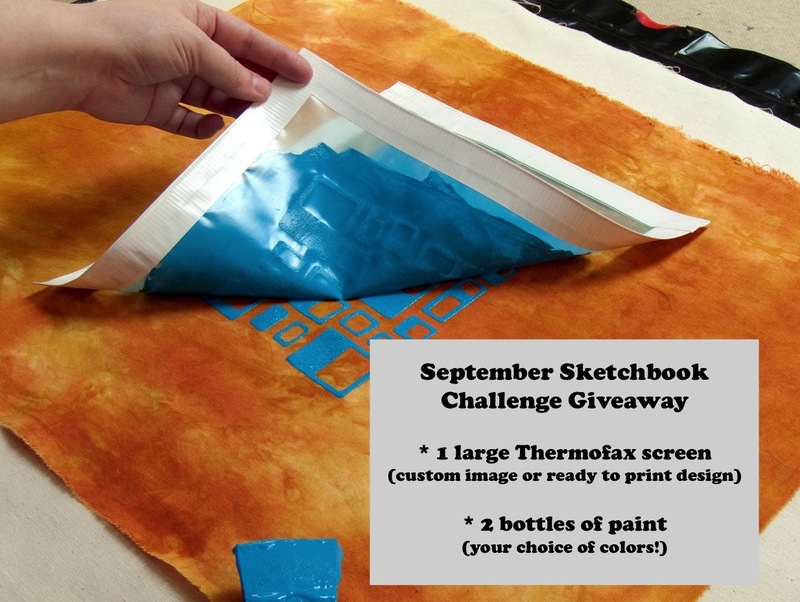 Post a review of the sketchbook challenge e-zine on your blog or website and we'll enter your name into a drawing to win a piece of mail art from one or more of the Sketchbook Challenge artists! 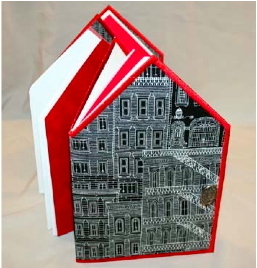 Send a link to your published review by 12/1/11 to sue at sue@suebleiweiss.com to be entered into the drawing. Winners will be announced in December - good luck! Hi all! Jane Davies here. I have been very busy lately preparing for a video I am shooting with Creative Catalyst Productions - a project which has been unfurling since June. I am SO thrilled with this project! Their videos are packed full of fabulous demos and useful information, and they are shot beautifully. 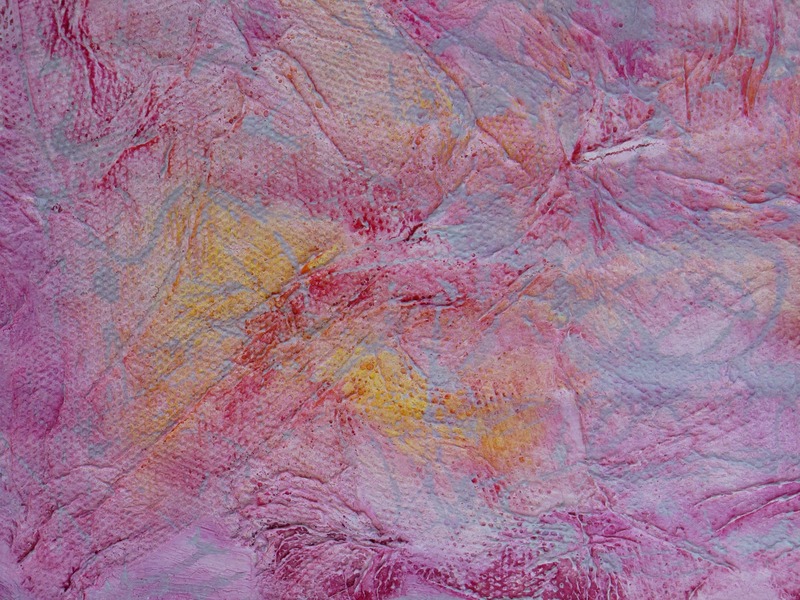 The video is based on my Scribble Collage workshop, but much expanded to include dozens of techniques for painting and decorating papers, including staining tissue papers, and then demonstrations on how I use them in collage-paintings. 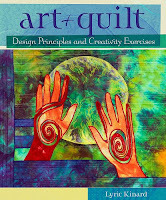 It includes loads of practical information and tips on color and composition, as well as on materials and sources. Get a preview of CCP videos by checking out some of my favorites: Anne Bagby, Ann Baldwin, Carrie Burns Brown, and Virginia Cobb are just a few of the CCP artists' videos I can strongly recommend. You can learn so much even by watching the sample clips! Come learn the basic alphabet of the visual language, the elements and principles of good design. I'll walk you through each element, explaining them in easy to understand language and metaphors. We'll observe each element of the visual language in the world around us. We'll learn to see with the eyes of an artist. Finally we'll put what we've learned into practice through practical exercises. The supply list couldn't be simpler. It could simply be called the “Try to find a commercial shower curtain that you like before you decide to make it yourself” story. All jokes aside, I love the curtain that I made. BUT I learned some really good lessons from this experience. 1. Lean wayyyy in to your sketchbook, really flesh out your ideas before jumping in without a well thought out plan. Can you see where this tale is unfurling to? I am a “let's try this and if we screw it up we can fix it later” kinda girl. I get great ideas (or they seem like it) and jump right in without figuring out the best way to do it. It works a lot of the time. But some of the time, I make things really hard on myself. I was so excited to get going on the appliqued flowers that I couldn't wait to have all my supplies. I didn't have enough (suitable) green fabric so I contacted one of my fabulous fabric dyeing friends for help. It's great to have “people”, ya know? My friend, Patsy Thompson, whipped out a couple of fabulous greens to choose from. They were so luscious that I had to use them both. What got me in trouble (not real trouble but “too much time messing with it” trouble) was that I went ahead and began sewing on some flowers before I had all of my supplies. I finished the first flower and had to hang the shower curtain back up (cause we had to take a shower...). The next day I realized that while I had sewn around the large green background fabric, I had neglected to secure the colored petals onto the flower. I used Mistyfuse (which I totally LOVE!) but I wanted to make sure that the smaller petals were there to stay. 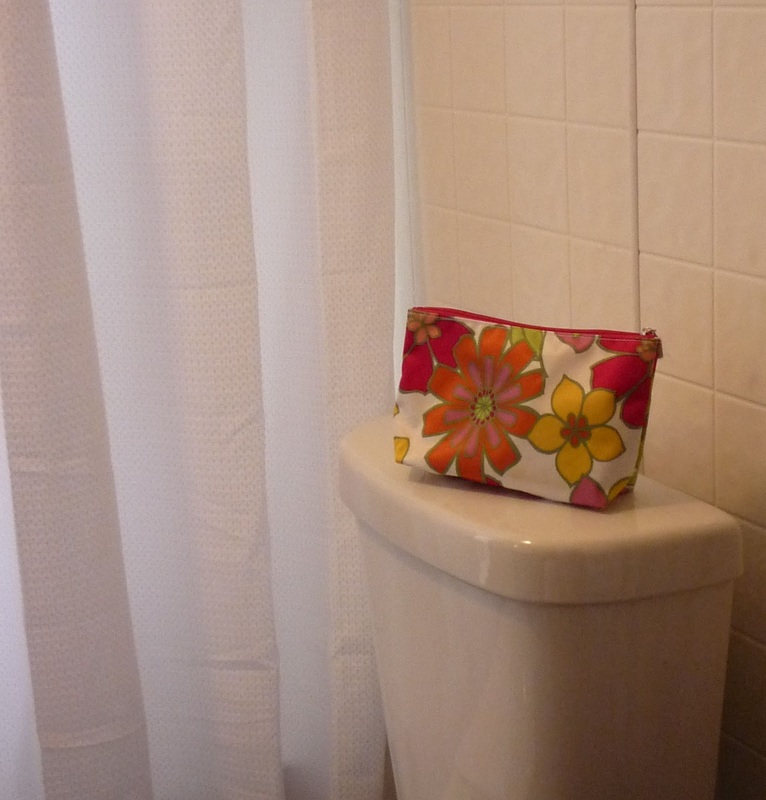 Well – I had to take the shower curtain back down to do that. And, yep, you guessed it – I had to put it back up that evening (cause we had to take showers, ya know). I must have taken that curtain up and down , um...well, several times. Wayyyy too many times actually. I later realized that the easiest thing to do would have been to leave the old curtain up while I was working on the new one. 1. 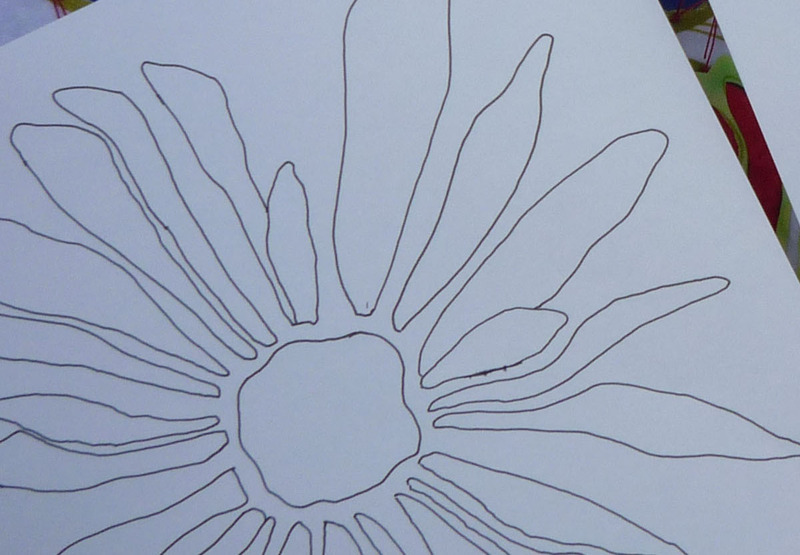 Draw a simple line drawing of a flower. 2. Create a Thermofax screen of the drawing (I can do this for you!). 3. 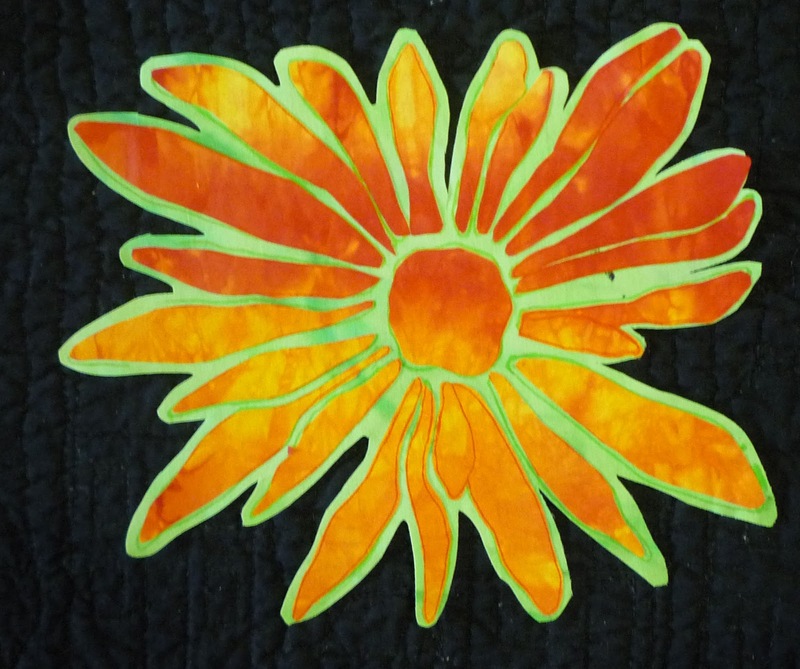 Screen print the flower onto five different colors of red/orange/yellow fabric as well as five separate prints onto green fabric. 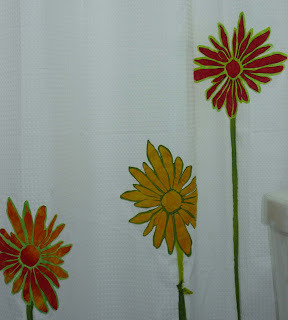 I used red or orange fabric paint for the red flowers and green paint for the green ones. 4. Heat set the fabric paint per manufacturers instructions. 5. Apply Mistyfuse to each fabric flower per instructions. 6. 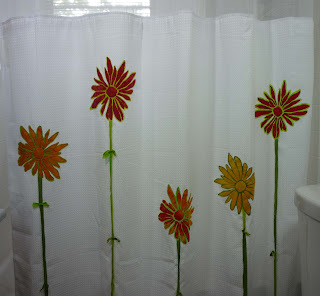 Using the screen printed lines as a guide, cut out each petal of the red (yellow/orange) flowers. 7. Using the screen printed lines as a guide, cut apx 1/8” to 1/4” away from the outside line of the flower shape. You will have the entire flower shape cut out as one piece. 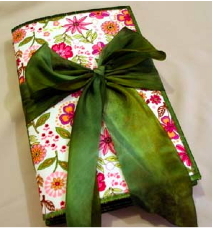 Look at the close up below to see how you will be using the green fabric. It will make sense to you after this. 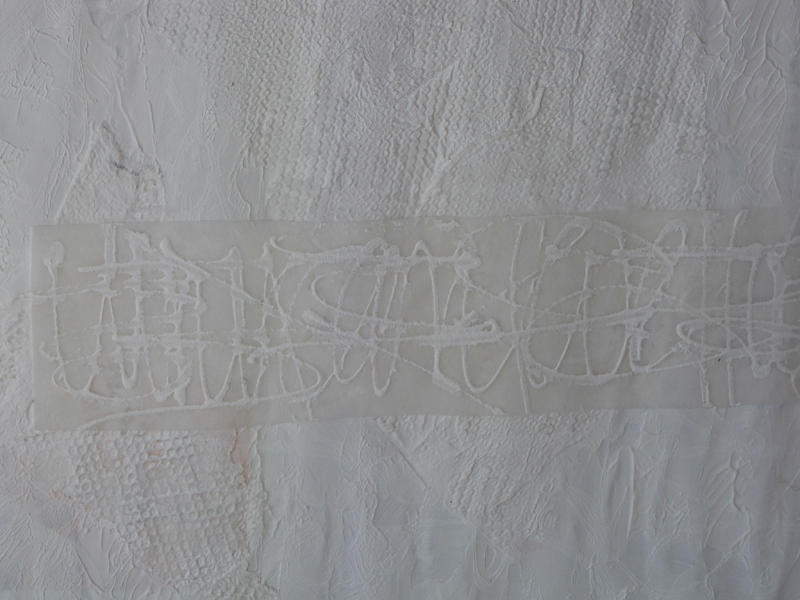 You can also see the lines of the screen print below. 8. Place the small petal pieces that you cut out onto the green flower shape. You will be able to see the lines for each petal on these shapes making it very simple to line things up. 9. Iron to activate the Mistyfuse per manufacturers instructions. 10. Using a small zig zag stitch with mono-filament thread, secure the petal shapes to the green background piece. Do this on all of the flowers. 11. 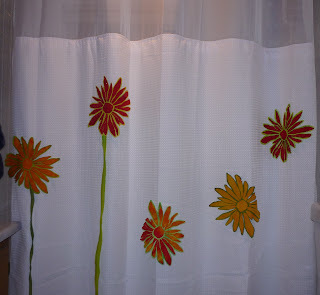 Lay out your flower garden on the shower curtain. Vary the height of each flower to give more interest. Fuse in place. 12. I used strips of torn green fabric for the stems of the flowers, varying the length of each one. I tied the pieces together, leaving the ends a little longer to mimic leaves. I cut the tips of the “leaves” at a slight angle. 13. Pin the stems in place. 14. Stitch each stem with a straight stitch, then secure each flower by zig zag or straight stitching around the edge of the flower. 15. 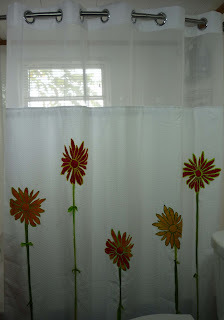 Quickly hang the shower curtain and grab a large glass of wine to celebrate your creativity. How one spark of an idea unfurled into a home dec DIY project. Certainly not me, although with my absence from this blog, you might think I have been! Hi, Judi, here! I'm sorry, dear friends, for vanishing for the last few months, but I know that while I was off dealing with a chaotic home life, my companions in the Sketchbook Challenge have been keeping the fun going for you all here with their color-filled and informative posts. So, let's check the status of my sketchbooks, shall we? Right. They've been on a shelf the entire summer, gathering dust and looking at me sadly every morning when I step into the studio to start working. 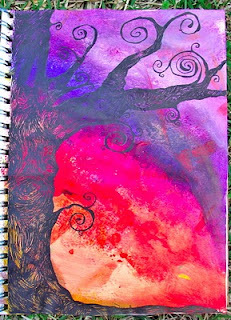 But I have to nod and smile at them, pat them a little for encouragement now and then, because the truth is that while I'm not currently working in a sketchbook, every single thing I've done this year has been based on a concept (Stacked Journaling) that was germinated, nurtured and grown in a sketchbook. Three years ago, I took sloppy care of my sketchbooks. I didn't use them much, except when I thought I didn't have anything better to do, and I added to them only as a lark, a break from the boredom in between the spaces where I made "real art". I was a silly fool. One little sketch, one tiny idea, one page filled with my terrible handwriting, one hand-bound book to contain my future aspirations- and my life has changed. 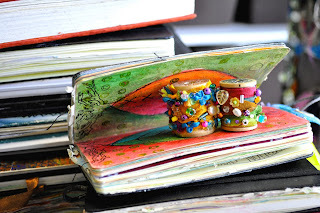 Get your sketchbooks down off that high shelf they've been relegated to, blow away the cobwebs, and give them a small hug (go ahead, no one's watching!) And then unfurl your talent into their pages. When I was a young girl, I used to love to ride my bike. I would wake up early (my mom said that someone had to wake the chickens, right? ), eat a quick breakfast and jump on my trusty stead. What I felt for my bicycle could be described very easily. I rode a bike almost everyday until I was 16 (then I discovered boys with cars). One day a couple of months ago my husband and I rented bikes to make sure that we wanted to ride regularly before we purchased one. And, in all honesty, to make sure that my back and hip could take it (I have back and hip "issues"). And of course, it was great! I felt the same exhilaration that I did when I was younger...that same feeling of freedom (maybe with an additional ache or two!). Why allow her gallant husband to offer a solution! He loaded my bike into our car and we all took off to the complex where the games were. 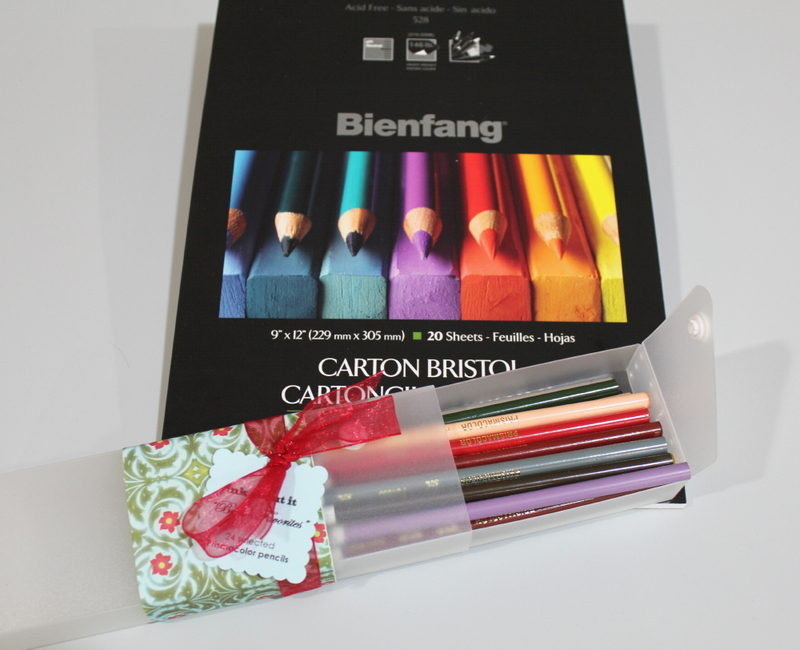 I made sure that I had the necessary sketching tools & supplies. I took off on my bike (Electra Townie 7D) (awesome round town cruiser). I rode over and watched a little bit of youth football (and those cute little cheerleaders), a softball game, a soccer match, and a baseball game. I got a little bit of exercise, let the wind blow through my hair and then set up to draw. First I drew my Townie. Now the back wheel really isn't that small...It was late, I was getting tired, the light was bad - okay, how many more excuses do you want? My bad but I still love the simple lines on that drawing. And the fun of it is this - I'll draw it again and it will be a better next time! Remember - if you don't USE it, you'll LOSE it. By the time I finished the Townie, it was too dark to draw anything else where I was. So I headed down to the baseball game. I love the way that the gardenia petals unfurl as the bud opens, don't you? They remind me of waking from a summer's nap at my grandmothers home. She had huge shrubs just full of sweet blooms outside of the bedroom that I napped in. I'd wake with the windows open and that sweet smell greeted me. The gardenias remain one of my favorite flowers to this day. So - remember to exercise your body as well as your mind. Use your eyes to really see the world around you as you use your hands to draw what you're seeing. I hope that you all are enjoying the Sketchbook Challenge Blog as much as we all are! Have you looked at all of the FREE tutorials? Be sure to check them out as well as the Flickr pages. New photos are going up everyday and I never cease to me amazed by the sketchbook pages that folks are sharing. They are opening their eyes to the world around them. Jane LaFazio here. Thought you'd enjoy another film by Danny Gregory, this time about his pal, Tommy Kane, drawing on location. You'll find this free project sheet on my website here - have fun with it! A fun line drawing of some of my favorite things...stacked on top of each other! Detail...complete with an abstract quilt. Lots of fun dots. Another detail, with the cup and saucer from the month where the theme was "opposites"
Inspired by a chapter in Carla Sonheim's book about stacking objects. 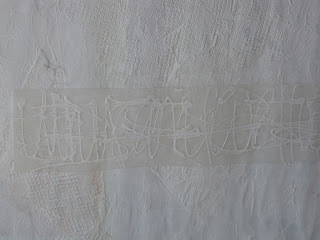 Unfurling with Travel and "Mail-Art"